Dave is a regular columnist for Model Boats magazine, one of the best publications in the world for those interested in scale ship modeling. 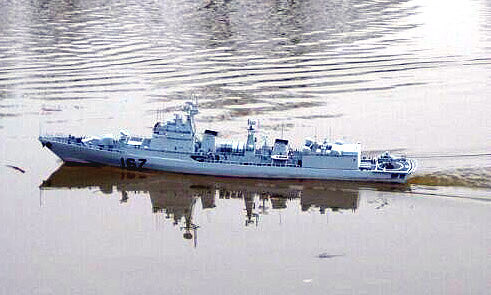 Soviet / Russian warships by Colin McDonald taken during Navy Day. Stromboli (AORL-5327) This model was built from original plans over the course of 4 years, and is now near completion. A speed 400 motor with belt driven reduction powers a single brass 4 bladed propellor to drive her at scale speeds. Roberto recently fitted the Stromboli with a smoke unit, which greatly adds to the realism of the model on the water. 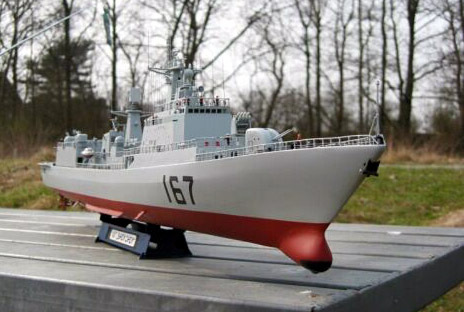 Tom Stark from Germany sends in photos of his 1/200 scale Luhai Class Guided missile destroyer. Tom built this model with the Trumpter kit. 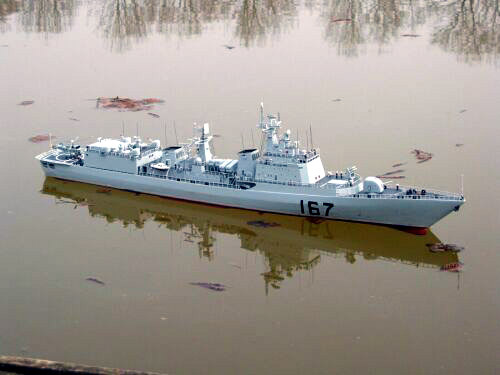 Trumpeter makes a number of nice Chinese and Soviet Destroyer modesl that would be suitable for radio control. Steve built this model using the last production Type II kit from Small World Models. 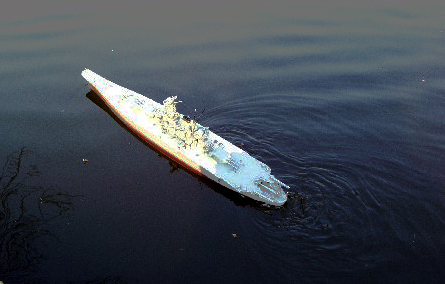 Though this kit is no longer in production, the company offers many fine submarine kits. Steve is also using that companies WTC (Water Tight Cylinder, the heart of the working model submarine) which he modified by substituting two Graupner Speed 400 geared motors for those supplied with the cylinder. Although the gear train is noisier than the direct drive unit, Steve hope to get a much longer running time in return. At this point, the model is 85 % complete, with electronics and final trimming left to go. This submarine features working torpedoes and will also include a sound system! A successful test voyage behind him, Steve's U-boat is now ready to menance the ponds around San Diego. Steve fills the propel tank on the boat. The propel is used to pressurize the ballast tanks, forcing the water out and allowing the boat to rise to the surface. 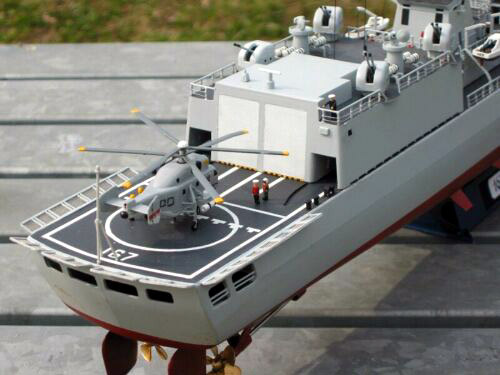 JC built this model in 1/350 scale using a plastic model kit, which was converted for R/C operation. 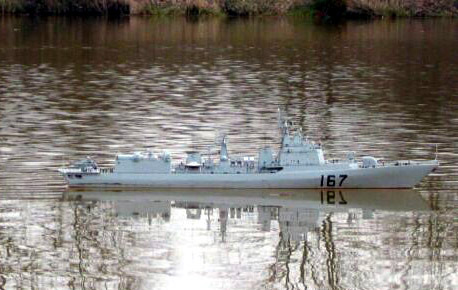 It is shown during her initial sea trials April 18, 2003. 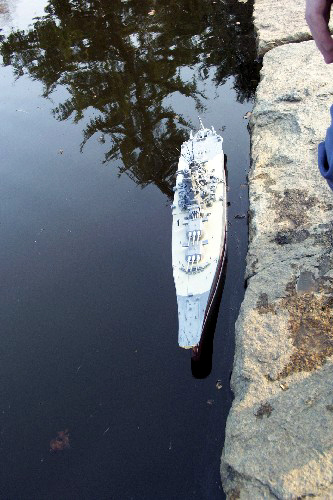 This shows that you don't have to spend a fortune to get into radio controlled model warships.